IRONWORKS, Canada’s first stacked industrial/commercial space, is receiving broader recognition for our unique and innovative design, featured in the March 2018 Industrial Innovation Spaces Report produced for the Vancouver Economic-Commission (VEC) as part of the Planning Studio Course at UBC’S School of Community and Regional Planning (SCARP). This SCARP program pairs graduate students with community, municipal, and private sector organizations in order to work together to create a more sustainable economic climate in Vancouver. Affordable and innovative spaces are seen as critical in supporting emerging industrial enterprises. Co-location hubs are light industrial spaces shared by independent, complementary businesses, and social enterprises. They primarily offer shared spatial amenities and opportunities for low-growth businesses and enterprises to enter new markets and create a stronger socio-environmental impact. IRONWORKS is highlighted and studied as a leader in co-location hub development. 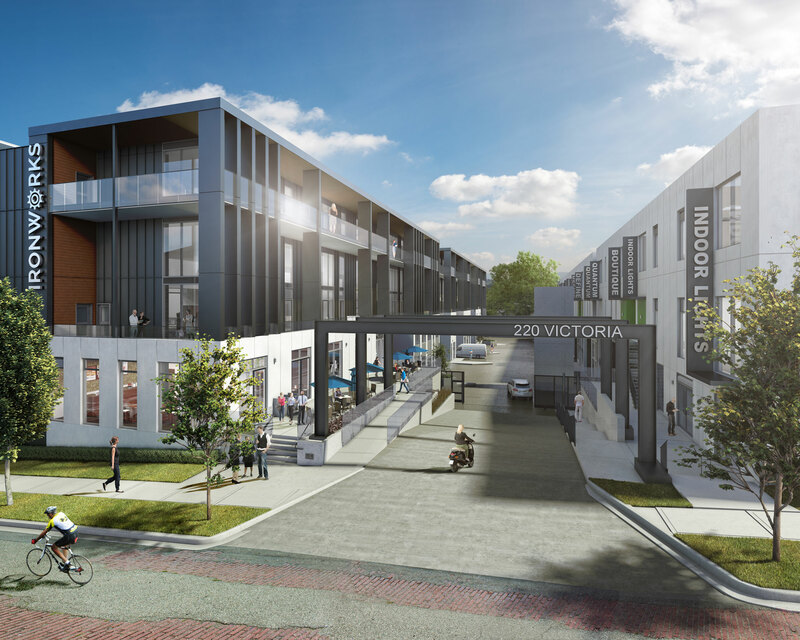 Our IRONWORKS development, in East Vancouver’s Port Town community, consists of two contemporary buildings separated by a mews. The buildings cover a full city block and include mixed-use space with showroom, office, industrial, and warehouse flex space. The Industrial Innovation Spaces Report evaluates the featured spaces by looking at criteria around tools, approaches, and sustainability impacts, commenting on how the IRONWORKS built form reflects in these areas. Our integration of a stacked industrial and mixed-use design is seen as forward-thinking in an evolving economy within a highly constrained industrial land supply. IRONWORKS is designed for mid-sized, industrial, and commercial users. With clear ceiling heights of up to 26’, 3,000 – 14,000 square foot units, and the flexible characteristics that come with mixed-use spaces, IRONWORKS allows for a greater accommodation of specific business needs. IRONWORKS provides functional space for specialized manufacturing, while accommodating the modern sector of the industry such as creative production and tech companies. As the definition of industry continues to evolve over time, flexibility is key in adapting to the ever-changing landscape of our city. It becomes more important to accommodate those businesses that continue to grow. Emphasis is put on interviewing potential buyers, allowing us to work with owner-occupiers rather than investors or speculators. This encourages the inclusion of local businesses that stay true to the Port Town neighborhood vibe, creating a vibrant community hub and mix of businesses. IRONWORKS welcomes complementary as opposed to competing businesses into the spaces ensuring a cohesive and connected environment. IRONWORKS includes a common mews between the two buildings to access at-grade loading facilities and parking for customers. A common freight and passenger elevator grants access from the parkade to the lobby, mews and upper levels to allow for lighter industrial deliveries to spaces above grade. A large common loading dock facility is also shared by and accessible to all users. This shared dock allows for large deliveries that are necessary for the business to function but may not be frequent enough to warrant the space and cost of a separate loading dock. As well, IRONWORKS has a common roof deck for users to enjoy the panoramic city, ocean, and mountain views. IRONWORKS is estimated to include thirty-five high-tech, service-oriented, and professional businesses. This will create nearly five hundred permanent jobs upon completion, increasing employment density in the vibrant and established Grandview-Woodland community. Contributing to the City of Vancouver’s Greenest City Action Plan, sustainability features include automatic lighting in common areas, unheated stair and elevator cores to reduce energy consumption, on-demand heating and cooling, south facing exposures to utilize passive cooling techniques, and electric vehicle charging stations. IRONWORKS stays true to the community of Port Town by selling to local businesses instead of selling to the highest bidder, thereby creating a space that embodies East Vancouver, providing opportunity & room for growth in the community. Vancouver currently has the fastest growing economy in Canada. Spaces like IRONWORKS contribute to the city’s healthy economic climate, allowing it to flourish as a global destination for technology, innovation, industry, and talent. Take a closer look into how IRONWORKS is featured in the March 2018 Industrial Innovation Spaces Report by UBC’s School of Community and Regional Planning (SCARP) & the Vancouver Economic Commission (VEC). Interested in owning your own space at IRONWORKS? Book a viewing today and find out what makes our East Vancouver office, warehouse and industrial spaces so attractive to growing businesses.